Wristwatches aren't cool anymore, although wrist-worn wearables are. What I mean to say is, a traditional wristwatch for telling time is an outdated technology mostly reserved for the AARP crowd. Sure, some people, myself sometimes included, wear them as a fashion accessory (like jewelry), but smartphones have rendered dedicated timepieces obsolete. It is for this reason that I find it curious that people desire a wrist-worn wearable smartwatch to look like their grandpa's watch. Why can't it look like an all-new thing? It's reminiscent of when some companies designed CD players to look like old-time radios or when Chrysler released the godawful PT Cruiser. If you are stuck in the past, the LG Watch Urbane may be just for you; it is an Android Wear smartwatch that doesn't look like one. As you can see above, it is a luxurious-looking watch, featuring steel and leather. The problem? It doesn't look like a smartwatch. Even the default analog watch face, while fancy-looking, is silly; you can have that information displayed in a much more readable way. Sure, you can enable a more futuristic and reasonable watch face on the LG Watch Urbane, but then the illusion is gone. What would be the point? Google lists the following specs. If you are interested in a more modern wearable design, I would point to Microsoft's Band, which is fresh and hip. Sadly, both Google partners and Apple seem hung up on having these things look like the wristwatches of our forefathers. Hopefully these companies will see the light in future designs. 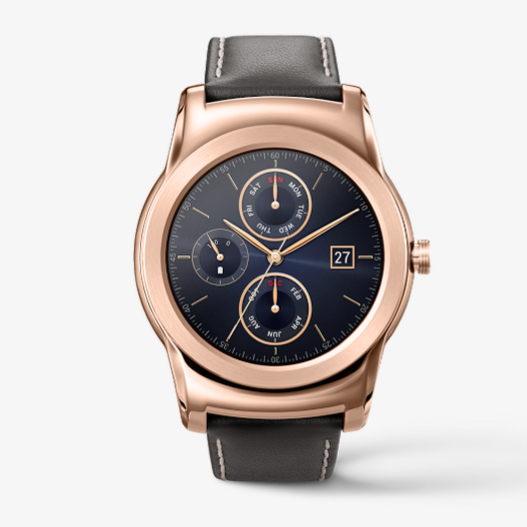 If you want to own a wearable that looks like a fancy dumb-watch, you can buy the LG Watch Urbane here for $349.